The Chakras are whirling wheels of energy, which exist on the etheric level. Each of the seven major centres is joined together at intervals along the spine. They are constantly moving, absorbing currents of energy. A free flow of life-giving energy is vital to the health and well-being of the person. All the chakras interpenetrate one another. Each chakra also corresponds to a particular colour frequency, and with a particular ductless gland or organ in the physical body. In a healthy being, the chakras absorb and distribute energy evenly, and in an unhealthy one, toxins may begin to collect in a particular area, causing physical, emotional or mental problems. They are constantly moving, absorbing currents of energy. The chakras are an essential part of our bio-energy system. A free flow of life-giving energy is vital to the health and well-being of the individual. The electro-magnetic energy circulating around the body stimulates various glands thus maintaining hormonal balance and affecting our whole metabolism. So although the chakra system exists in the etheric body, it has close connection and interrelates with the physical body. The chakra conducts and filters a constant flow of energy through us. Effective as rough hewn, tumbled-stone, sculpted, or jewellery. Healing, dowsing, gem elixir, talismanic charm. Jewellery, ornament, cleanser, rejuvenating generator for other gemstones. Is said to be probably the most useful crystal for All-round healing and cleansing. Said to remove negativity, and help get rid of pain and releases tension, (especially good with headaches and toothaches being connected to the Crown Chakra). Is said to be helpful in the case of bruises and sprains and swellings which will rapidly disappear if gently stroked with an Amethyst ‘palm stone’. Amethyst is also is said to be useful in intestinal complaints and stomach problems as it assists the utilization of vital Vitamins and minerals, and said to regulates the flora of the large intestine. Spiritually Amethyst is said to help quieten the mind and is an aid to developing deep inner peace. It will help alleviate grief and sadness and will give support to coming to terms with personal loss. In Arabic countries Amethyst was put under the pillows of children to prevent nightmares, and is another of the gemstones that resonates especially well with children. Amethyst is an ‘Angel Crystal’ and connects you more powerfully to your own Angels and Guides. May also make communication with them easier. Keywords. Stability, strength Invigoration, peace, Transmutation, protection, perfection. Lapis lazuli is an ancient gem, and as such, has a storied history. Egyptian cultures made a practice of burying a lapis lazuli scarab with their dead, and believed it to offer protection. The very earliest cultures valued lapis lazuli more highly than gold. Greeks spoke of an ancient sapphire which was included with gold and this was unmistakably lapis. Some believed that dreaming of lapis would foretell love that would be forever faithful. Lapis Lazuli is used with other stones when parts of the body need to be purified and cleansed and should be only used by a healer. Lapis Lazuli has high intensity and can open many of the chakra centres. This must be done only with love in the heart and comprehension in the mind and wisdom in soul. Effective as rough hewn, sculpted, tumble-stone or jewellery. Healing, dowsing, gem elixir, talismanic charm. Jewellery. Ornament. Contains the qualities of air, flight and movement. The energy of this stone is most useful at the location of the throat Chakra and the third eye Chakra. Blue Lace Agate is especially suited to those gentle and peaceful people with shades of pale blue in their aura. Can be very useful in the treatment of arthritic conditions and bone deformity. It can also be used to strengthen the skeletal structure. Very useful when used to help mend breaks and fractures of the bones and for developments of the fingernails and toenails. It can be used to help remove blockages from the nervous system and from those glands that are associated with digestion. In fact this crystal is a great help in either gaining or losing weight whichever is beneficial to you at any given point in time. This stone is helpful for problems involving the head and brain, and can also be used as an elixir for the eyes. All-round gentle healing to whatever else has been prescribed. In other words a good addition to any assortment of healing crystals, and one which will complement them all. Peace, movement, grace, encouragement, strengthening, eliminating, assimilating. Jewellery, ornament, palm stone, Tumble stone, healing stone. Birthing stone. Malachite is one of the minerals that is surrounded with myths and legends, some people call it the Luck Stone, and it is indeed supposed to represent wealth in your life to some extent. Also called the ‘Birthing Stone’ it is also used for healing and to help obtain knowledge. Malachite gets rid of shyness, and encourages the desire for knowledge. Emotionally it stimulates our inner imagery, dreams, imagination and memory. Physically, malachite dissolves cramp, helps with menstrual problems and facilitates Labour and birth….it is the stone to give to someone who is about to have a baby! It also stimulates liver activity and has a detoxify effect, it alleviates rheumatism and stimulates the nerves and brain activity. It has many gifts to offer us in the way of healing, it is said to protect against radiation, and can be used in the treatment of; asthma, arthritis, swollen joints, tumours, growths, broken bones and torn muscles. It seems as if malachite I can have a beneficial effect in most illnesses! Emotionally it represents fidelity in love and friendship, loyalty in partnerships, and practicality and responsibility in business transactions. It may also enhance psychic abilities and is protective for those who fly for a living. Healing, protective, encouraging, birth stone. 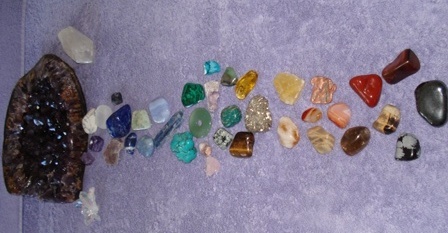 Tumble stone, Talisman, jewellery, healing stone, palm stone. Disperses accumulations of negative energy and transmutes it into positive energy. Also said to be a bringer of wealth, place in a little cluster of situation inner cash box will produce income and help to maintain the state of wealth. Useful for balancing the energies and aligning the Chakra’s it stimulates both mental focus and endurance. Good use in areas of education and challenging exams, business pursuits and relationships. An excellent stone for soothing family or group problems. It can aid the digestive and assisting treatment of digestive disorders, and can promote the circulation of the blood. It has been used to balance the thyroid. Spiritually, citrine encourages individuality, self-confidence and courage. It helps us to overcome depression and free ourselves from oppressive influences…also being courageous and able to express ourselves, will help alleviate diabetes in its early stages, fortifies the nerves and has a general warming effect…should be worn in contact with the skin for healing purposes. Healing, warming, good for digestion, self-confidence, self realisation, balance in mind and body, exams, group workings, encourages wealth. Primary healing crystal. Bestows courage and steadfastness. Should be warn close to the skin for healing. Healing for the small intestine and for the stomach area in general. Carnelian alleviates rheumatism and stimulates the Metabolism and is therefore very helpful in weight loss. It cures fear and rage, and helps to banish sorrow. Carnelian encourages love and love of self. Together with Hematite and Ruby can repel psychic attack. Good for neuralgia gall stones, kidney stones, allergies and colds. Used as an elixir can help heal cuts and abrasions. Protective, balancing, healing, helps in weight-loss. Tumble stone, palm stone, ornaments, jewellery, and talisman. Should be kept close to the body all the time it is being used, many colours and varieties but all have similar properties. In ancient Egypt, jasper was used for making amulets. The scarab amulets were carved from it. It has always been known as the ‘warrior stone’ as it gives the strength and courage. It also gives us the ability to ‘answer back’ where necessary and not to be taken for granted. Very useful in someone who suffers from feelings of worthlessness as it will give them courage and a better feeling of self-confidence. Emotionally it imbues courage and readiness for conflict in the ability of being able to deal with things in a forthright manner. Spiritually it helps us pursue and achieve goals with determination. Red Jasper is the most dynamic for this. Mentally, jasper stimulates uprightness and honesty especially towards ourselves. It gives us courage to come to grips with unpleasant tasks and it helps transform ideas into action. Physically it stimulates the circulation and the energy flow, it helps the immune system and has a detoxify and anti-inflammatory effect. It helps with diseases of the sexual organs and with digestive problems, a very good antipollutant. Jasper was often worn by Shaman to provide protection. Can be used to align the energy of the Chakra’s and balance the Yin & Yang energies. Courage giver, stimulator, immune system cleanser, detoxify are, protection, balancer of energies. Loved your Mandela afgan. I want to make it. Then I discovered your stone s. I have been a rock hound all my life, but am coming back to it more after retirement. Helen, can you recommend a source for stones that are reasonably priced? Thank you in advance. My shop 🙂 you do not say where you are, or what type of stones you are after, maybe send me a message using the contact page and I will help you.